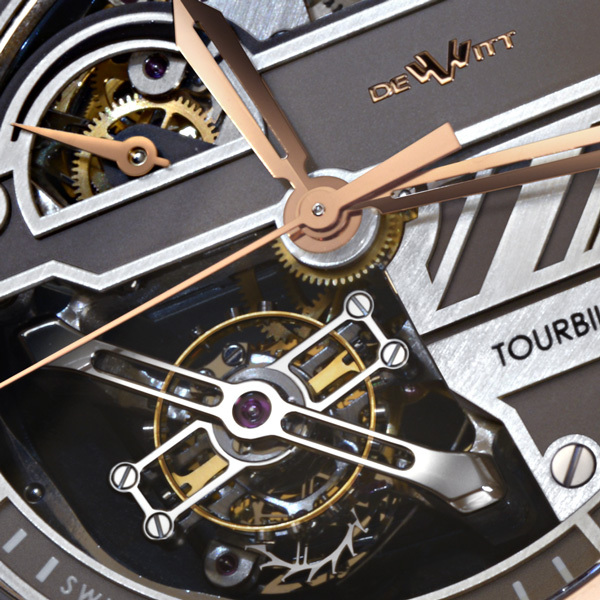 DeWitt unveils its latest technical innovation, the Twenty-8-Eight Tourbillon Prestige watch, a limited edition of 99 pieces, entirely conceived and assembled at the DeWitt Manufacture by its own master watchmakers. The new Twenty-8-Eight Tourbillon Prestige houses the calibre DW 8015, developed from the DW 8014 movement that was first presented in 2010. 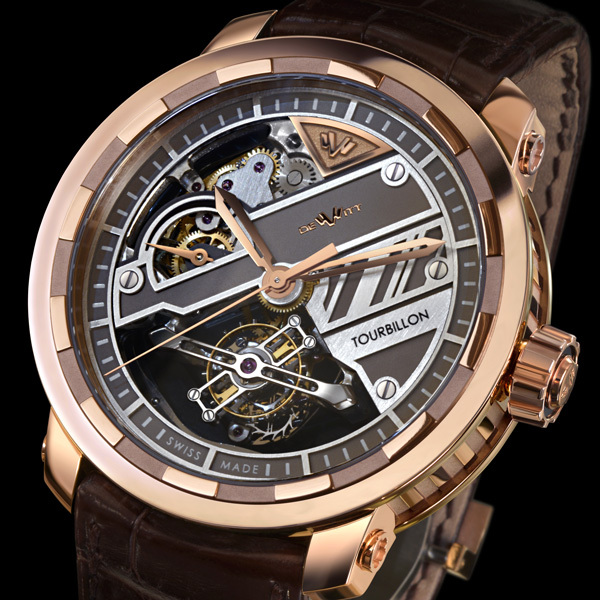 This automatic Tourbillon introduces a patented and extremely ingenious Automatic Sequential Winding (A.S.W) device, driven by a peripheral oscillating rotor. The A.S.W. device distributes a constant flow of energy to the main gear-train thanks to the sequenced winding of the barrel. Such a technical prowess makes it possible to obtain an ideal functioning range through the use of a single, manual-type barrel. Moreover, it avoids all the running defects observed when slip-springs are used on conventional automatic calibres. The peripheral oscillating rotor is attached to a ring with a sinusoidal profile on its inner edge. This particular shape will, in turn, activate the patented A.S.W system which enables the movement to always operate in an ideal functioning range, between 92 and 96% of the main-spring torque. The escapement is therefore guaranteed to always receive a constant and stable flow of energy thanks to this sequenced winding. Indeed, two little arms, rocking up and down thanks to the rotation of the sinusoidal ring, ensure the winding of the barrel until it reaches 96% of the movement’s full winding. At that moment, a lever disengages the pawl from winding the barrel and forces it to continue its movement in the air, without hooking on to the wheel. The movement then runs on its accumulated reserves of energy, until it reaches 92% of the power reserve, and the pawl then hooks back on to resume winding the barrel. Such a technical prowess makes it possible to obtain an ideal functioning range through the use of a single, manual-type barrel. Moreover, it avoids all the running defects observed when slip-springs are used on conventional automatic calibres. The method of displaying the dead-beat seconds hand in the centre of the dial makes for easier reading of the time. In direct contact with the Tourbillon cage, the ticking dead-beat seconds hand marks a pause for each second counted, which beautifully outlines the precision level achieved by the oscillating balance. Built out of some 334 components, the calibre DW 8015 is the perfect illustration of the inventive audacity of DeWitt’s master watchmakers. It combines the horological classicism of the tourbillon with the technological innovation of the A.S.W. (Automatic Sequential Winding) device. Moreover, the heart of the balance beats to the rhythm of a Straumann Hairspring® with Phillips curve. Developed from seven different elements, the alloy used is unbreakable, self-compensating, non-oxidizing and anti-magnetic. The perfect homogeneity of the hairspring and its incredibly precise flat rolling of 0.0001 mm, or 0.1 of a thousandth of a millimetre, give it its extremely high precision, thus guaranteeing the high performance of the mechanism. The construction of the movement and of the dial take their inspiration from the world of architecture, using solid geometrical forms inspired by industrial metallic structures. Thanks to an open-worked mainplate, the carriage of the Tourbillon is thus suspended in the air, producing an effect of transparency and of plunging into the very heart of the movement. 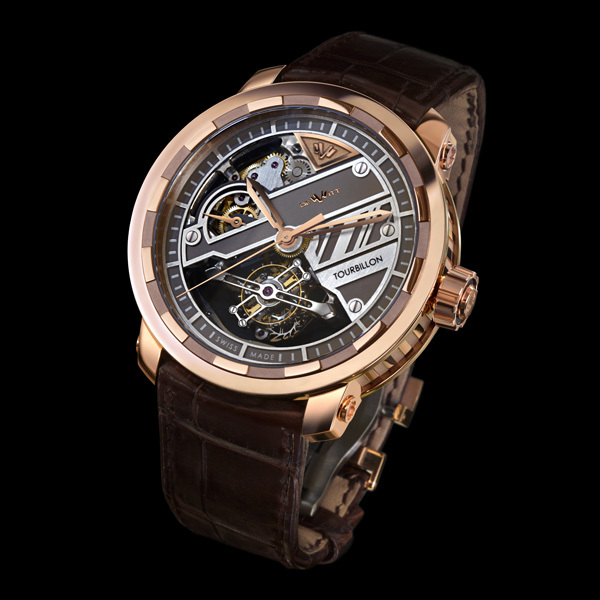 The gear-train is unveiled through a dial featuring a fitted rhodium-plated matt chocolate-coloured grid. This robust, masculine aesthetic is reinforced by a series of screws. The power reserve is of 72 hours and is indicated at 9 o’clock by a hand that covers a 180 degree segment. 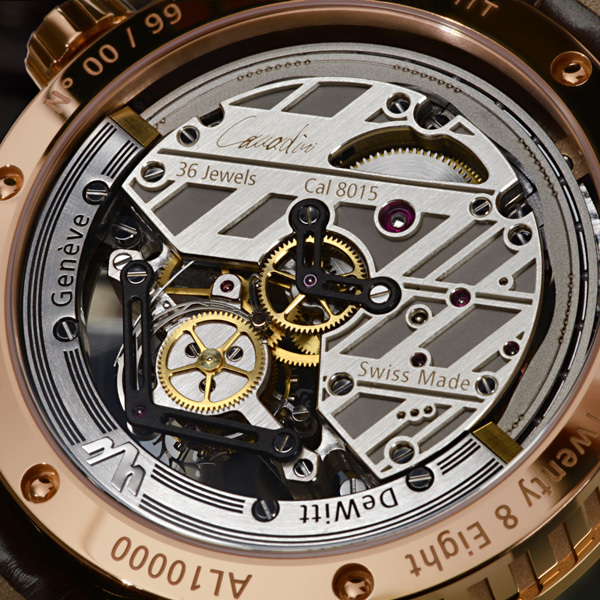 Its 46 mm case in 18-carat rose gold, adorned with the famous DeWitt imperial columns, matches the applique "W" signature in 18-carat rose gold at 12 o'clock, the hands and the gear-train of the movement. On the back of the case the two re-designed rear bridges mark out a strong contrast with their black PVD-treated surfaces. Like all great DeWitt complications, the Twenty-8-Eight Tourbillon Prestige watch bears the signature of the watchmaker who assembled the timepiece, this time directly inscribed on the movement's rear bridge. Last but not least, the new DW 8015 movement fully complies with the very demanding finishing norms established by the DeWitt Manufacture: Circular Côtes de Genève, satin-brushed surfaces, circular graining, polishing and bevelling. Hairspring® with Phillips curve sequenced at 2.5 Hz.